Did you know that the nutritional value of store-bought produce declined by 10% to 20% in the second half of the twentieth century? The low nutrient density of grocery store vegetables may be one reason why we crave more even after we've eaten our recommended daily allowance. 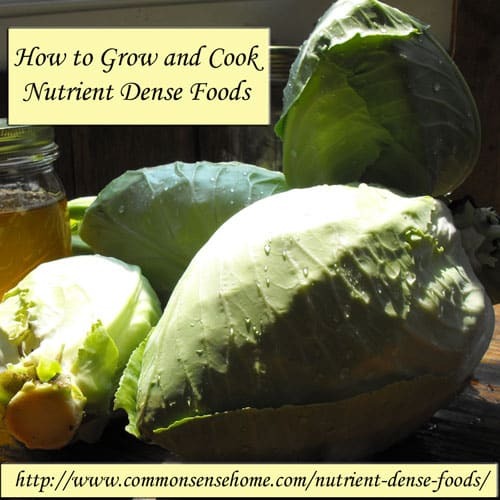 The good news is that you can easily learn how to grow and cook nutrient dense foods. These fruits and vegetables that taste so good even your kids will ask for more. The first step in your journey toward nutrient density is figuring out how to tell the difference between watered-down “baby carrots” from the grocery store and crisp, sweet gems pulled from your garden row. Many gardeners buy Brix meters, which are an inexpensive way to measure sugar content, with the theory being that produce higher in sugars is also higher in vitamins and minerals. You don't need to spend any cash, though — it's pretty simple to train your taste buds and eyes to do the same job. Learning to pay attention to the sweetness of the vegetables we eat is easy, although you might need to cut down on your consumption of sugary treats to recalibrate your sweet sensor. Sweet and complex flavors are both indicators of higher nutritional value, as long as you haven't added sauces or spices. Get into the habit of sampling a bite or two of your produce raw to calculate its sweetness as you chop and you'll soon be able to tell high- and low-Brix foods apart. Color is another good indicator of nutrition. Brighter orange carrots, winter squash, and peaches tend to be richer in vitamin A, while redder apples have usually spent more time exposed to the sun and are higher in vitamin C. As long as you're not eating lollipops (or artificially-colored oranges), bright colors and sweet flavors are good for you. Now you're ready to plan your garden so you're growing fruits and vegetables bursting with flavor. Many wine-makers will tell you that the best grapes have to struggle a little, and this is true of quality vegetables too. Don't over-fertilize and over-water your garden or you'll end up with watery strawberries like the kind sold in the grocery store. On the other hand, a few bug-nibbles can tempt the plant to pack away more vitamins in its leaves and fruits, so get used to slightly imperfect vegetables. No-till gardening techniques and homegrown compost will keep your soil in top condition so plants will be able to find micronutrients. In both cases, the key is organic matter and beneficial microorganisms, which work together to hold micronutrients in place and make them available to plants. If micronutrients aren't within reach, your plants won't be able to provide those micronutrients on your plate — even plants are what they eat. Soil tests are handy for determining whether your dirt is deficient in the nutrients plants need to grow and thrive. Soils lacking essential nutrients can be recharged with rock dust or by mulching with appropriate dynamic accumulator plants. Similarly, leaves from deep-rooted trees can be a good addition since these behemoths soak up micronutrients that have washed out of the reach of smaller plants. Be careful when using tree leaves on the vegetable garden, though — the high C:N ratio of this mulch is more appropriate around woody perennials like apple trees. You'll soon learn to taste the difference between strawberries picked after a rain and those plucked during a hot, dry afternoon. Pick fruits and vegetables on a sunny afternoon, when sugars, iron, and vitamins A and C are at their peak. Leafy greens are often most nutritious (and tastiest) at the baby stage, but fruits should be plucked when ripe. If possible, pick right before your fruits and vegetables are going to be cooked and eaten — as soon as they're severed from the plant, both foods begin to lose vitamins quickly. 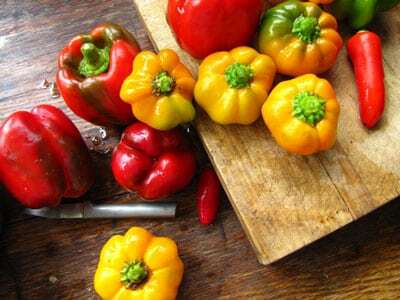 If you must store your produce, put it in the fridge rather than leaving it out in the sun or on a hot counter — wilting results in drastic reductions of vitamin C. On the other hand, keep okra, cucumbers, green beans, peppers, eggplant, and tomatoes on the counter since cold temperatures shock these warm-weather-lovers and reduce their nutritional profile. Meanwhile, don't cut up fruits and vegetables until you're ready to cook or eat them since early slicing results in loss of vitamins (with the exception of garlic, which will boost your immune system more if diced several minutes before cooking). 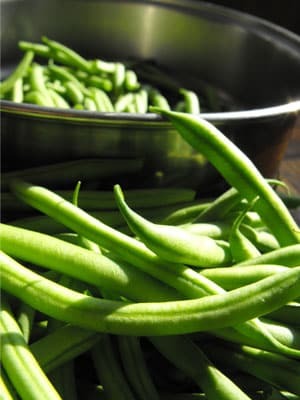 Steamed green beans are tastier and better for you than those boiled into submission with a hunk of bacon. 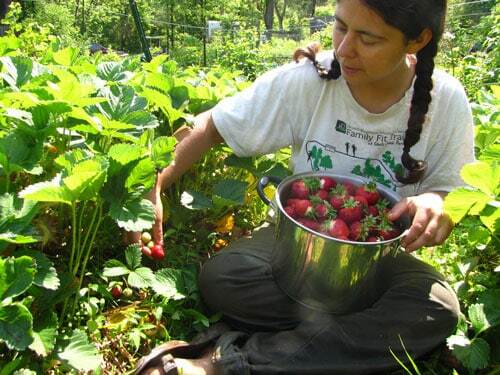 Wash fruits and vegetables using as little water as possible, or don't wash produce at all if you're picking homegrown vegetables that were kept out of the dirt with mulch and were never sprayed with chemicals. Many of the vitamins found in vegetables are water-soluble, so they can soak out into your rinse water, especially if the outer skin of the vegetable has been pierced. Similarly, try to keep cooking times short and prevent your vegetables from touching water — that means sauteing, steaming, and baking are better choices than boiling. Train yourself to enjoy the skins since many fruits and vegetables concentrate vitamin C, niacin, riboflavin, and vitamin A there. Most of the protein in potatoes is right under the skin, and all fruit and vegetable skins are high in fiber. Keeping salt out of your vegetables while they're cooking also helps reduce loss of nutrients. Applying the same techniques while preserving food will maintain flavor and nutrients. Anything that stores well in a root cellar will be tastiest and most nutritious if kept there, and freezing or drying are tied for the next most nutritious preservation techniques. If you don't mind the strong flavors, fermented vegetables can actually gain some nutrients during preservation due to the action of microorganisms. Canning comes in last due to the long processing times and water saturation. Do you have other tips for making sure your gardening and cooking efforts are worth the time? I hope you'll chime in with your own nutrient-dense recipes and techniques. This is a guest post by Anna Hess. 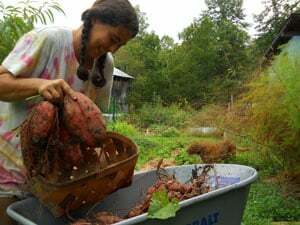 Anna Hess and her husband homestead on 58 acres of land in southwest Virginia, where they grow all their own vegetables and an increasing amount of their fruit and meat. Anna's new book, The Weekend Homesteader, starts you at the beginning as you learn to grow, cook, and preserve nutrient-dense foods. You can read more about her adventures on her blog at www.WaldenEffect.org. Great tips, but I don’t agree with her advice to pick on a sunny afternoon. Plants get starchier as the day progresses. Nutrients levels go down. 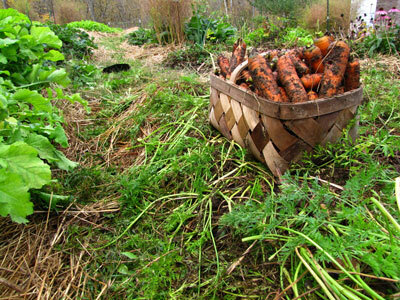 All good gardening resources suggest harvesting as early in the morning as possible. Plants regain moisture that they lost during the day during the night. Plants picked in morning before sun is high are sweeter, more crisp and last longer. They are also more nutrient dense Greens, especially lettuces get more bitter the longer they are in the sun. Oops, that should read that plants get starchier as the DAY progresses. Jenny – fixed your typo in your original comment. I agree, I generally pick in the mornings, although when I’m harvesting herbs I wait for the dew to clear. I think it depends on which vitamins and minerals you’re going for. Sweetness definitely increases with sunny weather and so does vitamin C (which is closely linked to light levels). Folks who use Brix meters see higher levels in the afternoon (which, of course, is really just measuring the sugars). interesting. I will have to research more. Everywhere (except Brix websites) says harvest early, after the dew has evaporated, but before the sun is high. I test my soil and adjust specifically for nutrient levels careful to take my cation exchange capacity into account. I want to grow the most nutrient dense food I can and harvest at peak nutrient level. I pay close attention to the soil food web, apply permaculture techniques, but somehow missed the part on high brix in the afternoon. The white milky sap in lettuce is more prevalent in the afternoon and makes it bitter. Would love to find specific info and which plants to harvest when. I might have to just get a refractometer to measure myself. The herbs, I have heard, are good to do in the morning – after dew evaporates but before the plants release their essential oils. always more to learn! I vote for taste testing at various times of day under different conditions. I suspect that any well tended garden is going to beat more store produce no matter what time of day it’s harvested. Interesting. This year we were advised to till hard lump charcoal into our soil – not a good idea? I am reading here not to till….Thanks! As in a variation of biochar? While I personally am working towards less tilling (some long term beds are no till), a little gentle soil tilling now and then isn’t going to destroy your garden. You just don’t want to be one of those people who constantly runs their tiller up and down between single rows of vegetables. You can actually apply biochar to the soil surface without tilling — that’s what I’ve been doing for the last couple of years with the charcoal I sift out of my wood stove ashes. It does slowly work its way down into the earth as you apply compost and mulch on top, but I’m not really sure that plain charcoal does the same thing as terra preta in soil that’s already moderately high in organic matter. So far, I’ve seen no differences in my beds treated with charcoal vs. those without. Have done alot of research and informal testing myself on nutrient density in home grown vegetables. Especially the factors that impact store bought produce versus what I pick from the garden. Nutrient levels are not necessarily synonymous with sweetness. While a freshly harvested plant will be higher in sugars and nutrients due to ongoing photosynthesis, a picked and stored plant will eventually exhaust those sugars through the process of respiration. Hence nothing from the store tasting as good as what comes out of the garden. However, nutrients such as vitamin content and phytochemicals, which are also produced during photosynthesis, deteriorate at a rate that is somewhat slower than the rate the sugars are turned into starches. So, home grown is always best. But sweetness does not directly equate to nutrient levels. I blogged about it in a store bought versus fresh article. JD – thanks so much for sharing your experience. I haven’t looked into nutrient levels in detail, as my harvest schedule is generally dictated by time available and taste. I believe that the mineral content of home grown veggies and fruits are more important as they can’t be made by the plant. I have been told that there are 77 bio-available minerals that humans need. I understand plants need around 9 at most. However, plants have the ability to absorb, convert, and store all 77 including what they require of course. I have been told that wood ash and weed burning is a good way to reduce over growth and weeds into usable minerals again for gardening. What do you think? A little ash might be good, but too much can be a bad thing because it alkalizes the soil. Another way to harvest weeds for nutrients is to chop and drop them (let them grow, and cut and let them compost in place before they seed out). You can also make weed tea, where the weeds are pulled, put in water and fermented for a week or so, stirring daily. The weed infused water is used for watering plants. The spend weeds can be spread in the garden or composted. Make sure to hot compost if seeds are present. Also, if primary minerals like calcium are badly out of balance, they can bind up absorption of other minerals. Many detailed soil tests from quality labs will offer suggestions for improving soil fertility.